For over 20 years, In The Swim has been selling swimming pool supplies and equipment directly to pool owners at DISCOUNT PRICES! 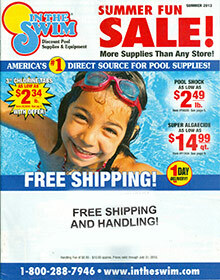 They're America's #1 direct source for swimming pool supplies, heaters, pumps and accessories. They carry a huge selection of swimming pool accessories, swimming pool supplies, swimming pool heaters and pumps, swimming pool liners and covers, swimming pool cleaners, filters and chemicals, solar blankets and reels, pool lights, pool games, floating toys and more! In The Swim has all the swimming pool accessories and swimming pool supplies you need for your in-ground or above ground pool, spa or hot tub. All merchandise is brand-name and first-quality. Their large purchasing power allows them to sell directly to you at substantial discounts. Experience easy online ordering, expert pool care advice and fast service! In-stock products ship to you the same day! Free Shipping (pay only a nominal handling fee).